What is a Long Tailed Keyword…and why do I want one? No the keyword “alligator” would not qualify… unless of course you sold alligators. Even then that single word is not what I am referring to. “alligator shoes” is better, but not quite the long tail I was looking for. How about “alligator shoes for women”? Now we’re heading in the right direction…. 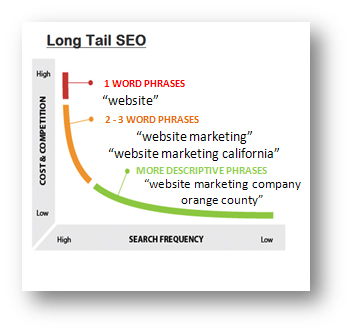 Long Tail Keywords are search phrases that combine 3 or more words. They will get fewer clicks, but they are typically less competitive (facilitating higher page positioning) and more targeted, resulting in a higher conversion rate. “website marketing” is better, but still awful competitive, and not nearly as targeted as it can be. Although my staff and I work with companies all over the Country, people have a tendency to geotarget their searches. Therefore “website marketing california” would be more appropriate for me. There would be fewer searches, but the quality of those searches would be much better. “website marketing company orange county” is about as long-tailed as you want to get. The number of search results that I am competing with goes down from about 192 million for “website marketing” to fewer than 300 thousand, AND I can be assured that whoever is doing the searching is targeting someone in my area for a reason. For every word that you add to your keyword phrase, there will be fewer searches conducted. For every word that you add to your keyword phrase, there will be fewer competitors in the search results. For every word that you add to your keyword phrase, there is one more opportunity to target your service or location. At the end of the day, I would rather have 5% of the traffic from 300,000 searches than 0% of the traffic from 192 million searches.